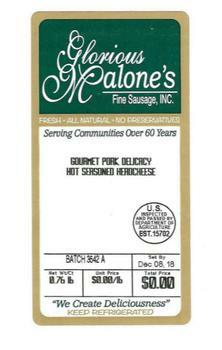 Malone’s Fine Sausage of Milwaukee, Wis., is recalling approximately 26,323 pounds of ready-to-eat pork head cheese. The products may be contaminated with with Listeria monocytogenes. Various weights of vacuum-sealed packages containing “Glorious Malone’s Fine Sausage, INC. GOURMET PORK DELICACY HOT SEASONED HEADCHEESE” with a “Sell By” dates from 10/26/2018 through 12/5/2018 and lot codes 3524 through 3540. Various weights of vacuum-sealed packages containing “Glorious Malone’s Fine Sausage, INC. GOURMET PORK DELICACY MILD SEASONED HEADCHEESE” with a “Sell By” dates from 10/26/2018 through 12/5/2018 and lot codes 3524 through 3540. The recalled products, bearing establishment number “EST. 15702” inside the USDA mark of inspection, were shipped to retail locations in Illinois, Michigan and Wisconsin, and also sold via internet catalog sales. Customers who purchased the recalled products should not consume them, but discard them or return them to the place of purchase. Consumers with questions regarding the recall may contact Daphne Jones at (414) 732-1820.